Mr.Ruan from Ho Chi Ming Vietnam suddenly felt abdominal swelling and lost appetite in May 2010. He thought it was momentary discomfort and paid no attention to that at the beginning. However, his body became thinner and thinner gradually. His family was very worried and thought Mr. Ruan must be sick and suggested him going to hospital for check up. After some tests in local hospital, he was diagnosed with liver cancer and immediate surgery was suggested. Mr.Ruan had accepted surgery and radio frequency ablation therapy after discussion with his family. His condition became better after surgery and soon Mr. Ruan discharged. Nevertheless after returned home, Mr. Ruan found illness did not improved but gradually worsened. By many inquires, his family discovered that Modern Cancer Hospital Guangzhou can apply twelve kinds of minimally invasive treatment to treat cancer. 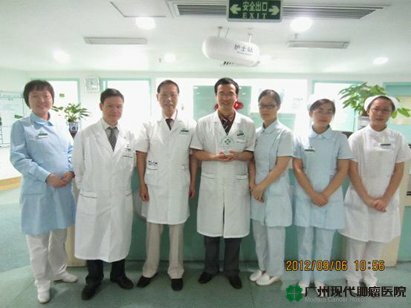 In order to seek further treatment, Mr. Ruan decided to travel to Guangzhou China. As Mr. Ruan got to Modern Cancer Hospital Guangzhou, he was immediately arranged to have checkup which CT indicated his lump had been 3CM. Dr. Tang, his attending physician, made a consultation aiming at his state of illness, symptoms and physical condition and instituted an individualized treatment regimens which would be illustrated to Mr. Ruan in detail about the treatment process and effect. Dr. Tang and other oncologists treated him by combining interventional therapy, immunotherapy, radio frequency ablation therapy and particle implantation therapy. The tumor of Mr. Ruan was reduced through treatment. Moreover, under the treatment by Dr. Tang and nurses care, his illness state and physical condition was improved, his quality of life improved. He came back to Vietnam soon. At the time of parting Dr. Tang carefully told Mr. Ruan that he should pay attention to the health. During hospitalization Mr. Ruan received much concern and he would carefully record them in the heart. In August 2012 Mr. Ruan was seventh times to hospital for follow-up and this time he was not only for treatment, but also came to give the elaborate gifts -- crystal decoration to Dr. Tang who carefully performs the treatment and the nurses who take care of him. The little gift can’t express the deep gratitude, but represented Mr. Ruan’s mind.